Welcome to the "Level C" sudoku puzzle page. These puzzles are definitely more challenging than the easy puzzles, but if you're familiar with how sudoku works, and you're a patient and persistent person, these puzzles are very do-able. 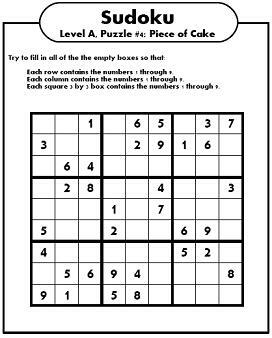 All of the sudoku puzzles you see here are free to view and print. I hope you enjoy them. Is this getting hard yet? This site is just chock-full of totally free puzzles to print.